The days are still warm here in the Midwest, but definitely not as warm as it was a week or so ago. The nights are actually getting downright chilly. They say it will dip into the '40's this week. Not necessarily time to break out the parkas but it sure motivates me to start whipping up warm bowls of soup for lunch. This Simple White Bean Soup was one I wanted to try as soon as I saw it over at Simple Daily Recipes. We've loved every recipe I've tried from Simple Daily Recipes. And this one did not disappoint. The best thing about Jill's recipes is that while they usually perfect for kids, t hey are flavorful enough to satisfy the grown-ups as well. Of course, the fact that they are usually quick and easy to prepare helps too! 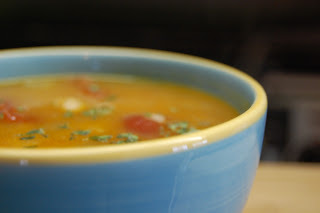 Even though I haven't had this one bookmarked too long, I'm submitting Simple White Bean Soup to Bookmarked Recipes over at Ruth's Kitchen Experiments this week. 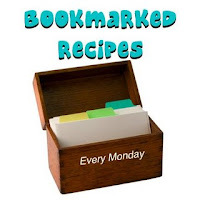 Be sure to check out the weekly round-up of great Bookmarked Recipes! Puree one can of Northern Bean with an immersion blender or food processor. Heat the oil in a large saucepan. Stir in the onion, and cook until it softens. Add the celery, tomatoes, and cook for 5 minutes more. Pour in hot broth. Stir in the beans and the bean puree. Season with salt and pepper. Simmer for 10-15 minutes. Sprinkle with a little extra virgin olive oil in individual soup bowls. This looks really tasty. Using canned beans and tomatoes makes it easier to prepare this dish on short notice. What a heart-warming soup Teresa. Simple & delicious. Thank you for sending it to the 'Bookmarked Event'. I'm hosting it this week since Ruth is away. See you at the round-up. BTW...love the very pretty ceramic bowl too. It's beautiful! !